One photo depicts a corpse lying on the dirt in a white dress, black spiders streaming out of her mouth, cradling a plump sleeping baby. 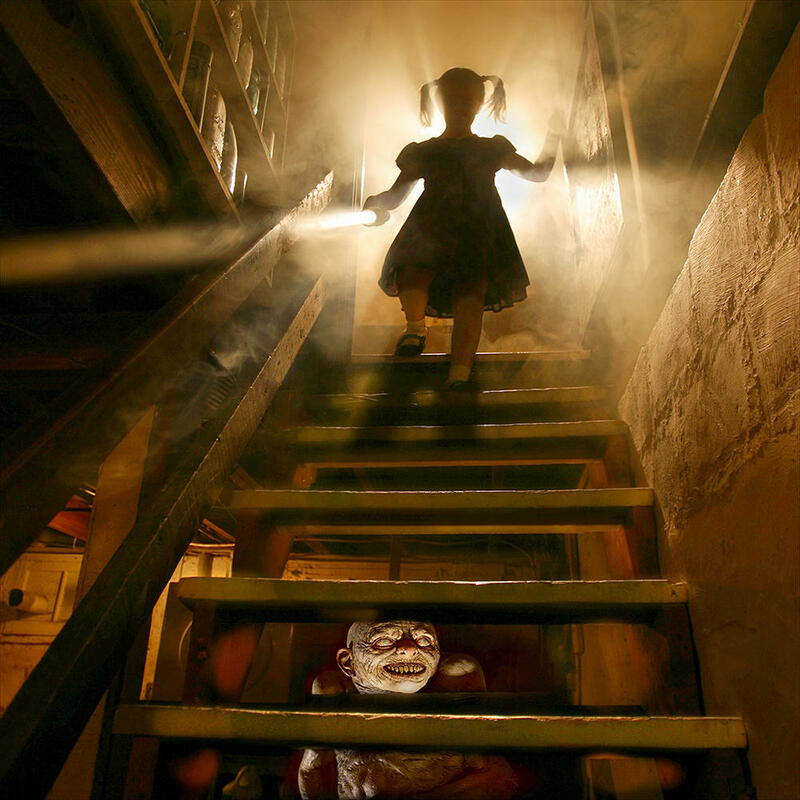 Another shows a little girl kneeling on her bed in her pink bedroom, screaming as the devil emerges from a jagged split in the floor. These photos are the work of local photographer Joshua Hoffine. Clearly, he doesn't take your typical wedding or graduation photos; his specialty is "horror photography" and the young kids in the photos are his daughters. While his photos might shock or disgust the viewer, things are different behind the scenes. "It’s a great time. It really is a lot of fun to do them," Hoffine told guest host Brian Ellison on KCUR's Central Standard. 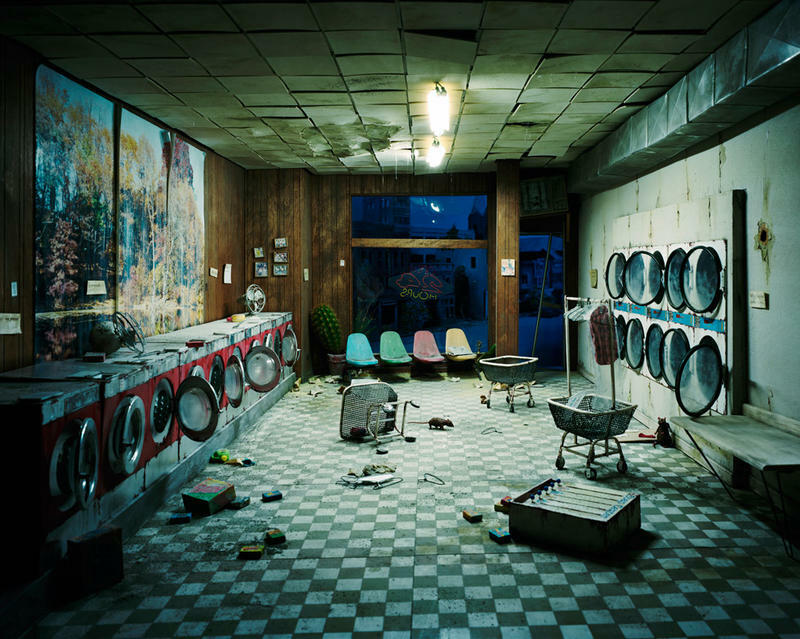 Hoffine started taking horror photographs in 2003. It was still in the aftermath of 9/11, and fear was in the air, he said. He decided to pursue that genre, incorporating childhood fears, fairy tale imagery and things that were happening at home with his young kids. He used two of his daughters in a photo series that he called “After Dark, My Sweet.” At the time, Shiva was six and Chloe was three. He wanted to make sure they weren’t scared. 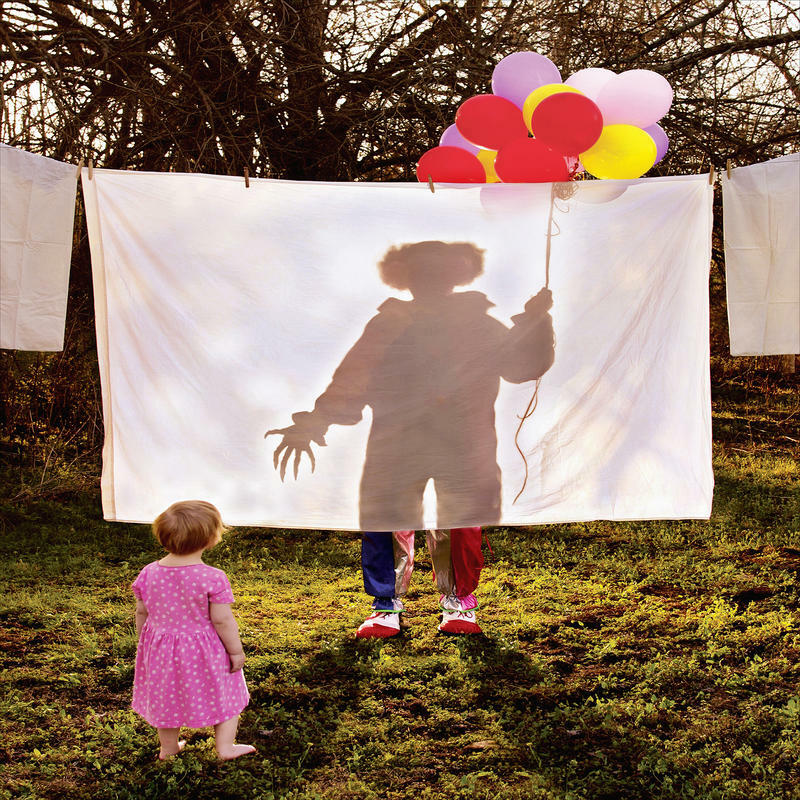 For example, in his photo, “Balloons,” Chloe is approaching a sheet that’s hanging on a clothesline. Behind the sheet is a silhouette of a clown with creepy claw fingers. The clown, he said, is the girls’ grandmother, and she wasn’t wearing any clown makeup. Even at a young age, his daughters knew what Hoffine was trying to do. “I think people might underestimate how savvy a three-year-old can be … she totally understood the artifice of it,” he said. While Hoffine dealt with classic childhood fears in his work, like the monster in the closet or under the stairs, he also channeled his own fears as a parent. Villains like the bogeyman or wolf, who are preying on his daughters in the photos, are stand-ins for child predators. “It’s meant to be a commentary on how those type of people are the real bogeymen of the world. Those are the real monsters,” he said. The photo series went viral in 2008, resulting in a wave of press and a lot of controversy. Hoffine still has a folder filled with hate mail from people who were concerned about his kids. “In their defense, when the work initially came out, there was no explanation. I think the only tagline was, ‘These are real photographs, these are real children,’” he said. But because people were concerned about child abuse, he started a behind-the-scenes blog to show how he put things together — and to show how the kids were having fun. Shiva and Chloe are now 18 and 14, respectively, and Hoffine says that they’re “fiercely proud” of the photos. But the Hoffine family has never hung those photos on the walls. “It’s one thing to create images, it’s another to have (the kids) living underneath pictures of themselves as victims,” he said. Hoffine has been raising funds on Kickstarter to publish his first book, a compilation of 13 years of work. He’s hoping to take the book around the movie producers to try to make a full-length horror movie that’s based on the ideas in those photographs. According to Hoffine, horror is an interesting genre because it’s metaphorical, psychological and existential. The world is insecure, chaotic and violent, life is fleeting, and horror gives us the vocabulary to deal with those types of fears, he said. “It gives you a splashy artificial way to approach your inherent fears, but that is probably the only time you’re invited to engage with those sort of taboo emotions, like fear or cruelty, or provide an environment where those feelings are sanctioned,” he said. “I do think that my role as a horror photographer is to show you what you don’t want to see,” he added. Jen Chen is associate producer for KCUR's Central Standard. Reach out to her at jen@kcur.org. What would the world look like without humans? In her homemade dioramas, Lori Nix, a Kansas-born artist, depicts a post-apocalyptic world where nature has taken over. Nix's photographs of her dioramas are on display at the Kansas Focus Gallery at the Nerman Museum of Contemporary Art. She'll be giving a talk about her work on March 24. Photographer Lara Shipley discusses Devil's Promenade, her photo series that depicts life in the Ozarks, where she grew up.